When I open Geforce Experience and check for updates, it always show Unable to connect to Nvidia error on Windows 10/8/7 2017. How to fix it? 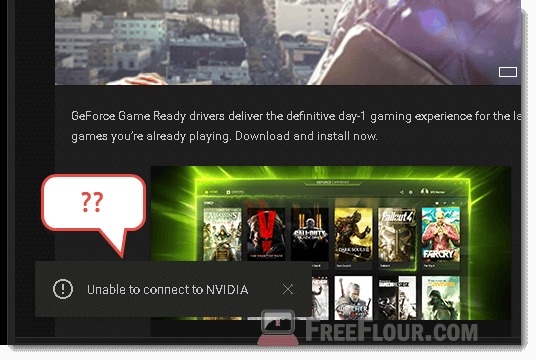 If you have encountered the following error in Geforce Experience – Unable to connect to Nvidia when you check for updates in Windows 10 / 8 / 8.1 / 7, here’s how you can solve it. Just when we are about to update our graphic drivers after fresh installing Windows OS or replacing a new video card, Geforce Experience shows error “unable to connect to Nvidia” whenever we check for updates. This has been a very well known error since 2014, but there still isn’t any solid fix from Nvidia yet. Solutions below are what other victims have tested and solved the problem. We have decided to share what we have found so far as we have had encountered the same problem multiple times across multiple computers of our own. There are more than just one solution because the cause of the problem can vary from computer to computer. We prioritize this solution because it’s the one that fixed ours. It involves deleting an Nvidia file, stopping and restart a few of its services. Browse to C:\ProgramData\Nvidia Corporation\NetService\, look for NSManagedTasks.xml and delete it. Launch Task Manager by CTRL – ALT – DEL or right click your taskbar. Go to the Process tab. At the bottom, enable show processes from all users. Look for NvNetworkService.exe. Select it and click end task. In start menu, or in Run, enter services.msc to open it. Look for Nvidia Network Service. If it’s not running, start it. Open Geforce Experience and try to check for update again. It should work now. Optionally, you can paste the following to a text file and rename it to anything.bat and run it. Some people have reported that these files and services cannot be found. We have no clue why, perhaps due to different versions of Geforce Experience for different OS or may even vary between Windows 64 bit or 32 bit. If this fix doesn’t work for you, move on to the next solution below. The other way to go around it is by heading to www.geforce.com/drivers and select the first option – Automatic Driver Updates. Doing this will download the latest versions of Geforce Experience. Upon running the installer, it will replace the old Geforce Experience previously on your computer. However, it is recommended that you manually remove and uninstall Geforce Experience before installing the new one. You can uninstall Geforce Experience by going to the Add or remove programs feature. Once installed, scan and check for updates again. It should now be able to locate and download the latest driver for your graphic card accordingly. The point of this fix is to completely remove your current Geforce Experience and install an updated GE. This is somewhat an advanced solution that should only be used with caution. This fix involves changing the mappings of IP addresses to host names. Let’s head to the file before we explain more about it. Lines begin with hash do not have any effect. By default, this host is supposed to not have any line with hash. Or simply remove x.x.x.x localhost. If you can’t edit the file, create a copy of it else where and paste it back to the folder to replace it. Try open up Geforce Experience and scan for updates again. Once again, removing any line in this host file may disrupt other apps which rely on it. Backup a copy of the file on your desktop just in case if anything goes wrong. If this doesn’t fix your problem, revert it back to what it was. If nothing works, you have no choice but to manually download the driver from either nvidia.com or geforce.com. You can also let nvidia detect your graphic card by using its the web auto detection interface that runs with java. Geforce experience is, in all honesty, very useful especially for its ShadowPlay feature to record and stream your games and its ability to change and optimize settings of every game you have installed in your PC. We wouldn’t want to give it up. We have fixed ours using the first solutions above. If none of those fixes works for you, you can still use Geforce Experience for the mentioned features but you won’t be able to connect to their server for updates and streams.